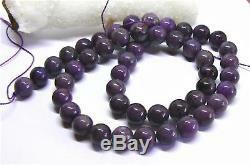 RARE AFRICAN PURPLE SUGILITE ROUND BEADS 15.5 8mm 190cts AAA 100% NATURAL. 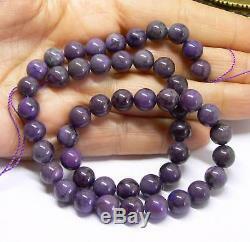 GORGEOUS 100% NATURAL UNTREATED PURPLE AFRICAN SUGILITE PERFECT ROUND BEADS!! 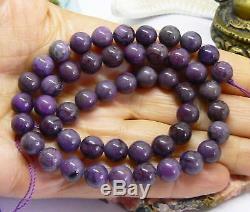 49 GORGEOUS AAA SUGILITE BEADS IN THE STRAND!! 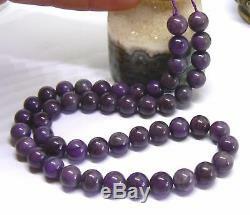 The SUGILITE ROUND BEADS measure 8mm DIAMETER!!! (Measurement conversion: 1 = 25.4mm). 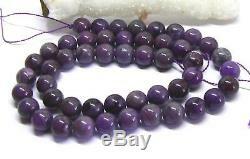 BEAUTIFUL HIGH QUALITY POLISHED NATURAL 100% NATURAL UNTREATED PURPLE SUGILITE BEADS!! SUGILITE IS ONE OF THE NEWEST AND RAREST GEMSTONES!! EXTREMELY RARE RARE GORGEOUS BEAUTY OF NATURE!! Can be used as absolutely gorgeous necklace, bracelets, amulets, talismans, EARRINGS or for your custom gemstone collection. Thank you so much for looking. Please check my other auctions. We offer fine jewelry, rare natural gemstones, Tahitian, South Sea, Kasumi pearls. 5 0 for each additional item ships in the same package (must be paid together). WE WANT HAPPY CUSTOMERS ONLY! Get images that make Supersized seem small. Tailor your auctions with Auctiva's. 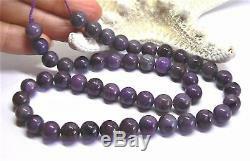 The item "RARE AFRICAN PURPLE SUGILITE ROUND BEADS 15.5 8mm 190cts AAA 100% NATURAL" is in sale since Friday, September 7, 2018. This item is in the category "Jewelry & Watches\Loose Beads\Stone". The seller is "aphrodita_8" and is located in Brooklyn, New York. This item can be shipped worldwide.